When learning a new tune, one of the first things guitarists work on is the chords and rhythm. This is especially true for jazz waltz tunes, which challenge your counting and sense of time with a 3/4 time signature. One of the most popular jazz waltz tunes to learn is Bluesette, a fun 24-bar 3/4 tune, written by Toots Thielemans, with a number of descending ii Vs and ii V I changes. Learning Bluesette chords and rhythms teaches you how to play this tune, and solidifies your jazz waltz comping over other tunes at the same time. In this lesson, you learn the chord shapes and 5 rhythms over Bluesette. These shapes and rhythms give you everything you need to get started on this tune in your comping, and later chord soloing studies. Before you learn the Bluesette chords, here are 5 rhythmic patterns that you can learn and apply to the chord study below. The first rhythm places a rest on the first beat of each bar, with quarter note attacks on the rest of the bar. Leaving one rest per bar challenges your counting and keeps you locked into the time and form when comping in 3/4. Memorize this rhythm, work it with a metronome, then take it to the backing track and full form below when ready. In this rhythm, you only play the chords on beat 2 of each bar. This forces you to count and work on always knowing where the beat and form are in your comping. Though it’s only one chord per bar, the counting can be tough. So, go slow, work this rhythm with a metronome, and build your confidence with this rhythm before taking it to the backing track below. You now place a chord on beat 3 of each bar as you work on spacing out your rhythms and create interest at the same time. The next rhythm breaks the bar of 3/4 time into two equal halves, meaning you place a chord on beat 1 and the & of 2 in each bar. When doing so, you take the 3 quarter notes, 6 8-notes, and divide them into dotted quarter notes, 3 8-notes each. Though it looks easy on paper, this rhythm takes time and effort to become smooth in your playing. Count along and use a metronome before working this rhythm over the backing track below to ensure you’re accurate with these chords. The final rhythm anticipates the next chord change as you place a chord on the & of 3 in each bar, a half a beat before the next bar starts. Doing so can cause many players to rush or jump ahead on the time, so use a metronome and count along to help prevent that from happening. Now that you know what rhythms to use when working on these Bluesette chords, here are shapes to check out over that progression. These chords all have the root as the lowest note of each shape, which helps to hear the changes when learning a new progression. Once you can play these chords with the 5 rhythms above, drop the root and repeat those exercises. 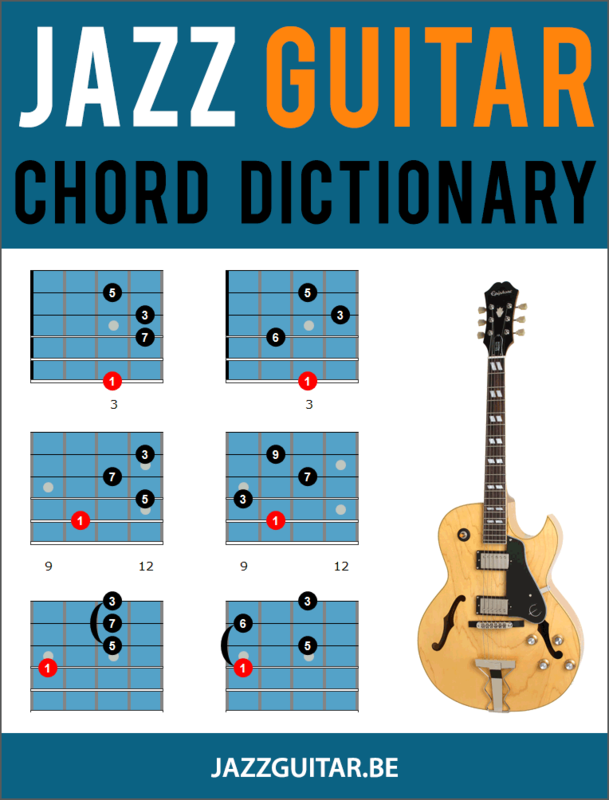 Dropping the root note gives you a whole new set of chords without learning anything new. It also gets the root out of the way when playing with a bass player or second guitarist, where it could clash with what those instruments are playing. Learn these chords, work them over the backing track, apply the 5 rhythms, then drop the root and repeat to get the most out of this chord study. Evergreen jazz tune by Toots (RIP)…great tune to play in all 12 keys! Thanx. Glad this one came along… I’ve actually been working it up for a trio. I’m happy that my chords match yours for the most part?. Thanks for providing all the lessons and insight! Learn these changes and you get two for one! The other being Blues for Alice, as Bluesette is based on Bird changes.